When it comes to managing scarce water supplies in California, it’s important to know where the fish are to avoid killing them during pumping and transfer operations. Up to now, this has been difficult, but new open-source software may provide the solution. The question is foundational to conservation biology and policy. To take a conservation action, you need to know where to act. And, yet, for decades, stewards and researchers of aquatic fauna have been sorely lacking the tools to systematically collect, store and map data on where California’s freshwater fish are located. This need led the U.C. Davis Center for Watershed Sciences to develop “PISCES,” an open-source suite of data and software providing the most comprehensive and accurate information on current and historic ranges of California’s fish. The center has just released PISCES to the public; the software and data can be downloaded for free from its website. The data also can be viewed from interactive maps on the website showing species ranges or species richness. More than a data aggregator, PISCES converts different forms of data to a standard format and provides easily updatable, high-resolution maps outlining species’ ranges with the best and latest location information available. The program also produces summary California maps showing the overall distribution of fish, patterns of biodiversity and areas where biological data are lacking. assisting the Nature Conservancy in its recently published comprehensive assessment of California’s freshwater ecosystems. A 2014 center study by Ted Grantham and co-researchers Joshua Viers and Peter Moyle is a good example of how PISCES can be used. The scientists found PISCES invaluable for quantifying the impacts of individual dams on California’s native fish. They needed precise information on the current and former ranges of imperiled species in relation to dams. This data can in turn be used to determine which dams would provide the most benefit to native fish with improved flow releases. For Moyle, a U.C. Davis professor emeritus of fish biology, PISCES is the culmination of several efforts to aggregate and digitize scientists’ scattered field notes and databases on the locations of California’s fish. Moyle made his first attempt in the mid-1980s in order to inform state fish and game wardens of the fish likely to be affected by proposed stream alterations. He and then-graduate student Paul Randall conducted a more sophisticated cataloguing and mapping of native fish ranges in the mid-1990s as part of the Sierra Nevada Ecosystem Project, a sweeping scientific study benchmarking the ecological health of the 400-mile-long mountain range. However, none of these efforts gained traction beyond the specific projects. The turning point came in 2011. 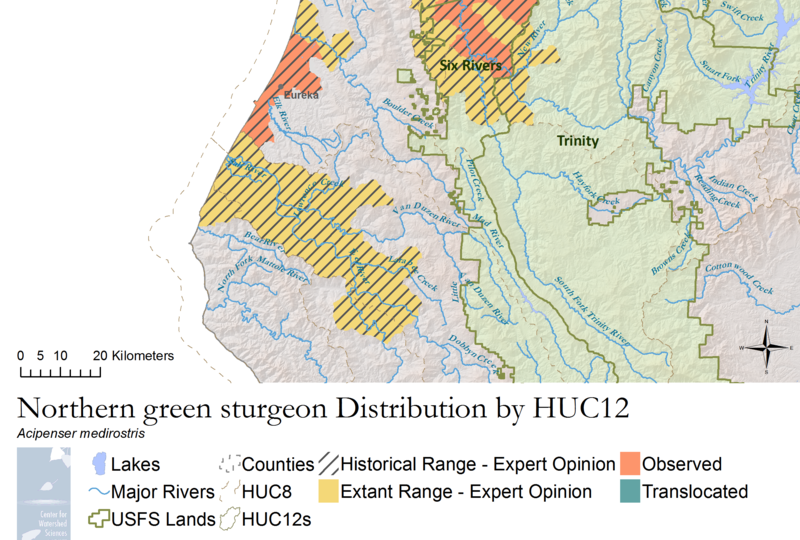 The U.S. Forest Service issued an appeal for accurate maps of fish species locations on California’s national forests, which cover one-fifth of the state. Moyle, Viers and graduate student Jacob Katz saw an opportunity to develop a comprehensive database. A team of center scientists and computer programmers embarked on an extensive literature search for empirical and inferred observations of fish locations. In many cases, though, the information was stored in the unwritten memories of veteran biologists such as Moyle. Researchers spent countless hours interviewing experts and poring over maps. By 2014, the group had collected 274,555 records documenting the range of California fish species. As open-source software, PISCES allows users to enhance the tools and software and propose updates and corrections on the data. The data are available in many standard spatial and relational forms accessible from ArcGIS, QGIS, Google Earth, Microsoft Access and other software. Although PISCES is focused on California fish, the software and database form a generalized system for tracking and analyzing ranges. The system can be quickly adapted to track fauna anywhere. Scientists can install and use the software to tweak their own species ranges, export data into other formats, generate custom range maps or create versions for whole new areas or species. Moyle said he can live easier knowing that his four decades of memories on species locations in California can be easily downloaded from a website. Nick Santos creates geospatial applications for the U.C. Davis Center for Watershed Sciences and developed the PISCES software.